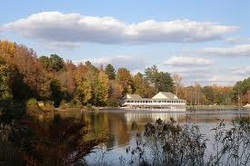 Holly Springs/Fuquay-Varina - Family Fun Carolina - Fun At Your Fingertips! Our professionally developed,non-competitive programs have been designed to build motor skills in a fun and nuturing environment,while fostering enhanced emotional, intellectual and social skills. It offers a visitor’s and environmental education center, conference room, deck, floating dock, free bank fishing, hiking trail and a wildlife observation platform. We're open year-round, 8 a.m. to sunset. Complete with volleyball courts and a multi-age playground already in place as well as two lighted baseball/softball fields and multiple soccer fields. Picnic shelters and an outdoor stage are also planned for the park. The stage will host a variety of cultural and musical events throughout the year including the Town's annual Labor Day Festival. Come experience the thrill of riding the rails - see, hear, and feel railroad history. The New Hope Valley Railway at the North Carolina Railway Museum has ride days once a month from May to December, with activities, themes, and events for all ages to enjoy. Contact us about charter group train rides, schedule operate-a-loco, or have a birthday party in a historic caboose. Each Applebee’s Neighborhood Grill & Bar is designed as an attractive, friendly, neighborhood establishment featuring moderately priced, high-quality food and beverage items, table service and a comfortable atmosphere that appeals to all ages. As "America’s Favorite Neighbor," each Applebee’s restaurant reflects its local neighborhood. The decor conveys this theme with photographs and memorabilia highlighting hometown heroes, local schools and area history. The Bass Lake Draft House is a family friendly restaurant. The atmosphere is relaxed and the conversation good. The game is always on because we have large flat screen TV’s everywhere and more satellite subscriptions and sports packages than you can shake a remote at. Our extensive menu features award winning hand-pattied burgers, excellent sandwiches, dinners, and appetizers including our signature Pickle Chips. And unlike many of the national chains, we have used non-trans fat oil with Natural Vitamin E and Omega 3’s in our kitchen since right after we first opened. Rocking Fuquay Varina, North Carolina, we specialize in over 25 flavors of wing sauces ranging in 5 different levels of heat, not to mention our to-die-for burgers, salads, wraps and appetizers. BullFeathers displays a warm atmosphere giving a whimsical, family-friendly mood with video games and trains for the kids. This non-smoking sports bar and dining room will satisfy anyone. Family owned and operated, we strive to make everyone feel at home while dining with us. We take pride in using only the finest and freshest ingredients to prepare every item on our menu. In fact, our pizza dough, sourdough bread, meatballs, chili, wing sauce, and bleu cheese dressings are all made-from-scratch daily in our restaurant. As our regular customers say, “Once you’ve tried Homegrown Pizza, nothing less will do.” We think you’ll agree. At La Rancherita Mexican Restaurant located in Holly Springs, the quality of our service is only surpassed by the excellence of our food. We have been serving the most exquisite Mexican foods for the past 15 years and we think it’s time that you experience it for yourself. As you enter La Rancherita Mexican Restaurant let yourself be whisked away by sights, sounds, and aromas… but that is just the beginning. Specializing in exquisite Mexican foods we guarantee one visit will keep you coming again and again. Lunch and dinner buffet with a family atmosphere. Everything we make at The Original NY Pizza gets our undivided attention to detail and we make sure that all our food is consistent year after year. All our vegetables are fresh, not in a can and our dough is made daily on our premises. We pride ourselves in using the finest cheese and the best tomatoes for that fresh taste that our customers have come to expect.